The following press release announcing MERLOT II was distributed on October 14 and the new version of MERLOT was shown publicly at the MERLOT booth at the show. 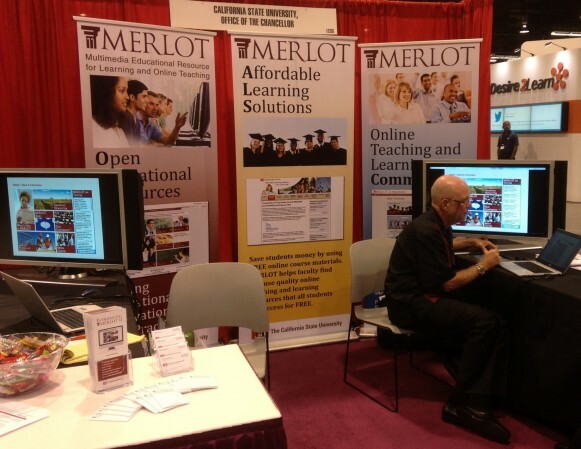 On October 15, CSU-MERLOT will premiere the enhanced Multimedia Educational Resource for Learning and Online Teaching (MERLOT II) website at the EDUCAUSE annual conference in Anaheim, Calif. One of the first peer-reviewed, open online libraries of higher education learning materials, MERLOT was developed by the California State University and is an open resource community that features more than 40,000 free online learning materials including open textbooks, open journals, animations, case studies, simulations, virtual labs and more for nearly every higher education discipline in an easily searchable open library. The CSU utilizes MERLOT to provide free access to high-quality online materials, a key part of the University’s initiative to use technology to improve student success while maintaining affordability. “As more faculty look to incorporate online resources into their courses, MERLOT continues to be a leader in ensuring that peer reviewed online learning materials are easily available and free of charge,” said Gerry Hanley, assistant vice chancellor of Academic Technology Services for the CSU Chancellor’s Office and executive director of MERLOT. New and improved features offered on the enhanced MERLOT website include simplified navigation, more powerful search functions, mobile-tablet readiness, access to new social networking features and authoring tools all aimed at delivering robust services that are very user-friendly for teachers and learners. MERLOT also serves a worldwide community of individual members, higher education, institutional and corporate partners all dedicated to improving education. Those who join the MERLOT community by registering as members can contribute learning materials, receive peer recognition and share their online expertise with more than 115,000 existing MERLOT members from across the globe. Please click here to view the new MERLOT website, access tens of thousands of free high-quality online materials and join the MERLOT community. MERLOT is a free and open online community and resource designed primarily for faculty, staff and students of higher education from around the world to share their learning materials and pedagogy. MERLOT provides leading edge, user-centered collections of peer-reviewed higher education online learning materials catalogued by registered members, as well as delivers a range of open educational services. MERLOT maintains its currency through ongoing and continuing communication with its worldwide supporters in a variety of ways, including the annual Emerging Technologies for Online Learning Conference with the Sloan Consortium, the Journal of Online Learning and Teaching (JOLT), member publications, news and our MERLOT Voices website to enable users to communicate with others. Next Next post: Is it Really Open?